Simple but invaluable steps will lead to shotgunning improvement. There are many ways to learn the finer points of wingshooting. Watch an instructional video. Read a book. Research the topic online. Take your pick of the low-cost or free shooting clinics held throughout the state at local ranges or hire an experienced shooting instructor. Then, armed with a good shotgun and a great deal of desire, accept the inevitable fact that there’s only one way to become a truly exceptional wingshot. Shoot. Drive to the range and shoot at every opportunity, every week of every month, and do it with an insatiable passion for the pungent aroma of fresh-burned powder and the crackle of shattering clay that surpasses all conceivable boundaries of time and money. Raw talent won’t hurt, either. With all this and more, the quest to become a bona fide world-class wingshooter becomes marginally attainable for a very select few. The rest of the shotgun-toting society consists of upland bird hunters or waterfowlers who carry their pumps and semiautomatics on a few precious outings every season. For them, the goal is considerably more pragmatic. If a single concept universally applies, it’s that bad habits are much more difficult to unlearn than good habits are to learn. Among those positive habits, balanced footing and consistent post-shot follow-through arguably constitute the most crucial. Many field shooters make the natural mistake of standing with one foot forward. Regardless of which foot you choose, it’s the wrong one. 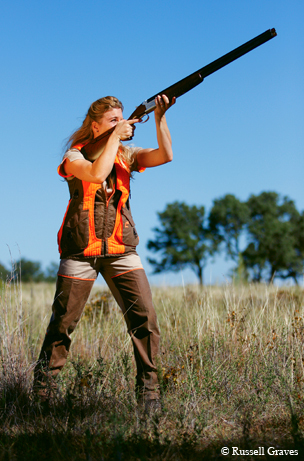 A left-foot-forward shooting stance — the default stance of right-handed shooters — allows the hunter to comfortably swing a shotgun to the right. Ditto for the right-foot-forward stance commonly assumed by a left-handed shooter. Neither one stands up to the field test, though, at the end of a 180-degree horizontal swing. A left-foot-forward stance affords all the balance of a two-legged tripod when a target is moving quickly from right to left. The same goes for a right-foot-forward stance and a wind-assisted bird that’s rocketing across a field from left to right. Shooters should always remember the 45-degree “safe zones of fire” when walking two or three abreast. The simple solution is to stand with both feet at shoulder width, toes slightly pointed out (ironically, the opposite of “pigeon-toed”). A shouldered shotgun isn’t required to demonstrably prove the point. Hold an imaginary gun and make an exaggerated swing to extreme right and left. Then mentally factor in the weight of the gun during the real deal, especially at the typically accelerated speed encountered afield. The results of a bad shooting stance are obvious enough to quite literally stumble over, thus creating a safety issue. Proper foot stance should be combined with the shooter bending slightly forward at the waist to allow the freedom of movement to either side and to counterbalance the weight of the shotgun and any possible recoil. This method provides the shooter with the most stability while in the field or on the range practicing. Following through after a shot, completing the swing, is just as critical as shooting stance and considerably more difficult to master. It’s important to keep a shotgun barrel moving after the trigger is pulled on a flying target. The amount of “lead” — the distance between the aim point and the in-flight target — is largely dictated by the target’s speed and direction. Shooters rarely miss as a result of excessively leading a target. Swing the gun in from behind, bring it well past the bird or clay and then swing it a bit farther before pulling the trigger. Always continue the swing after the report. One way to practice on the range is to keep the barrel moving and follow the clay target all the way to the ground if the shot is missed. Lead distance can be modified. A barrel stopped in midswing is a virtually guaranteed miss. If this appears to be an oversimplification, that’s because it is. Accomplished shooters spend lifetimes acquiring and honing their skills. These basics seem no-brainers to most of them. For the occasional wingshooter who follows the basic steps, a few cleanly downed game birds taken during a rare trip afield will always make for a world-class reward.